The Lipov gaj Apartment Village was named after the nearby park of majestic linden trees. The lawns and footpaths among the apartment houses highlight the freedom that apartment guests value above all else. From the apartments, there is just a short walk from your soft bed to fragrant grass, while a few steps more will bring you to the thermal pool complex and the Hotel Lipa with its culinary, wellness and health services. Available in various sizes, the apartments appeal to larger families and active guests who enjoy spending time outdoors. Discover the energy of nature and enjoy a relaxed holiday! The apartment village comprises 84 apartments (16 studios for 2 people, 32 standard apartments for 2+1 people, 12 standard apartments for 3+1 people and 24 apartments for 4+1 people). The apartments are situated in two-storey houses. Some apartments are on two storeys. Most apartments have air conditioning and a balcony. They offer views of the hills, the swimming pool or the hotel. 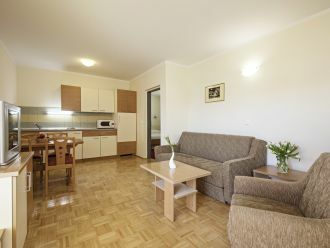 All the apartments feature a fully equipped kitchen (dishes, stove, refrigerator, oven – except in studios) and a living area. All apartments have TV and a bathroom with a shower. The apartment guests enjoy free admission to the 5 hotel pools: the indoor thermal pool (32-34 °C), the outdoor winter and summer thermal pool (34-36 °C), the indoor recreational pool (30-32 °C), the indoor children’s pool (30-32 °C, 10 to 45 cm deep) and the Gejzir outdoor thermal pool (36-38 °C). Guests also have free admission to the 3 summer pools in the outdoor pool complex: the Olympic-size pool (26-29 °C) with three waterslides, the outdoor children’s pool (26-29 °C, 15 to 60 cm deep) with two waterslides and the Grozd thermal pool (36-38 °C). The indoor pools are open from 7:00 to 20:00. The indoor pool is open from 9:00 to 20:00, while the Gejzir thermal pool is open from 7:00 to 20:00 and the Grozd thermal pool is open from 8:00 to 20:00. Night swimming is available on Fridays and Saturdays from 20:00 to 23:00. The indoor pools and outdoor pools connected to the hotel are open all year round. The summer pools in the outdoor pool complex and the Gejzir thermal pool are open during the summer season from 1.5. to 30.9. Bathrobes are available free of charge for half-board guests. Full-board and half-board meals are available in the hotel’s buffet restaurant, the Aperitif Bar in the hotel and the Taverna, which is connected to the hotel. Breakfast is served from 6:30 to 9:30, lunch from 12:00 to 14:00, and dinner from 18:30 to 20:30 in the winter and 19:00 to 21:00 in the summer. The Aperitif Bar is open from 6:30 to 12:00. In the Taverna, brunch is served from 10:30 to 13:00, while lunch and dinner are served from 11:30 to 23:00 (from 11:30 in winter). By the outdoor thermal pools, you will find the Bikini Bar (11:00 to 18:00), while the fast-food ŠRC Bar is open during the summer holidays (11.00 to 18.00). 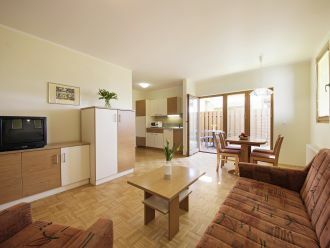 A spacious and comfortable apartment for three with a 180 cm wide king size bed and a balcony with a view of the park. The apartment (35 - 46 m2) features a bathroom with shower and toilet, dinner table, a pullout couch serving as an additional bed and a kitchenette. A spacious and comfortable apartment for four with a 180 cm wide king size bed, a 90 cm wide bed and a balcony with a view of the park. The apartment (44 - 50 m2) features a bedroom and a room with two beds – 1 x 180 cm and 1x 90 cm, a bathroom with shower and toilet, dinner table, a pullout couch serving as an additional bed and a kitchenette. 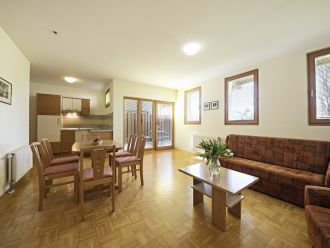 A spacious and comfortable apartment for five with a 180 cm wide king size bed, a room with two beds (1 x 80 cm and 1 x 90 cm) as well as a balcony with a view of the park. The apartment (57 - 61 m2) features a bathroom with shower and toilet, dinner table, a pullout couch serving as an additional bed and a kitchenette.